I got suckered into watching a TV dating show the other day. Like any good single woman, I said, “I’m just watching it to make fun of this concept, again.” I mean, it seems hard enough to find someone, let alone find someone through a media frenzy. So I sat down and got suckered in, mostly because it seems slightly crazy to go on national television looking for love. How do you know it’s real? Are they just on the show to get publicity? To get money out of the high rollin’ dudes? Are the guys only willing to date/marry someone because the women are willing to throw themselves in front of millions of people and possibly make a fool out of themselves? Gah! Just thinking about it makes my head spin. And the best way to clear my mind? Cooking. So I set out to perfect the taco.. with a sweet potato? Yeah, you read that right. And I think it came out fabulously. In a saute pan on medium heat, add olive oil, onions and peppers and cook for a few minutes until onion is softened. Add ground chicken and spices, and cook until chicken is cooked through. Add black beans and cook for another five minutes. Deglaze pan with white wine and once alcohol is cooked off, but mixture is still moist, add corn. Cook until warm. Wash sweet potato and poke holes in the skin (so it won’t explode in the microwave). Cook for four to five minutes in microwave. Turn over, cook for another four to five minutes until soft through. 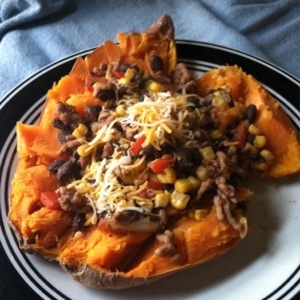 Let cool, cut open, and pour on the taco meat mixture over the opened sweet potato and add shredded cheese. Enjoy!